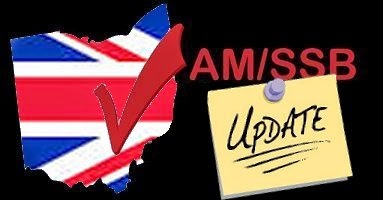 UK CB - AM/SSB Update! 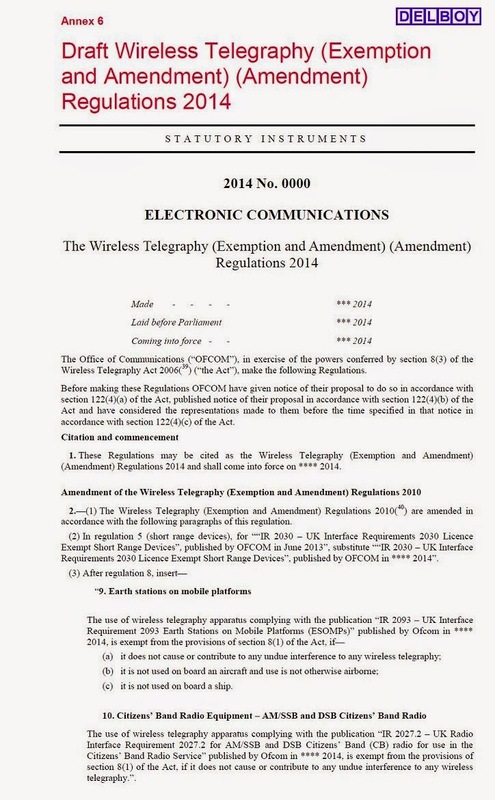 1.1 This document consults on draft regulations, the Wireless Telegraphy (Exemption and Amendment) (Amendment) Regulations 2014 (the ‘Proposed Regulations’). The Proposed Regulations would enable the use of certain wireless telegraphy equipment that comply with the technical parameters set out in the Proposed Regulations on a licence exempt basis. 1.2 Ofcom is responsible for authorising civil use of the radio spectrum. Under section 8(1) of the Wireless Telegraphy Act 2006 (the ‘WT Act’), it is an offence to establish, install or use equipment for wireless telegraphy without holding a licence granted by us, unless the use of such equipment is exempted. 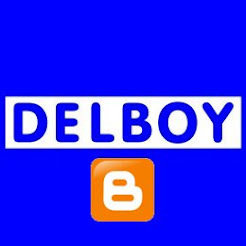 We are able to make regulations exempting the use of equipment by using powers conferred by section 8(3) of the WT Act. 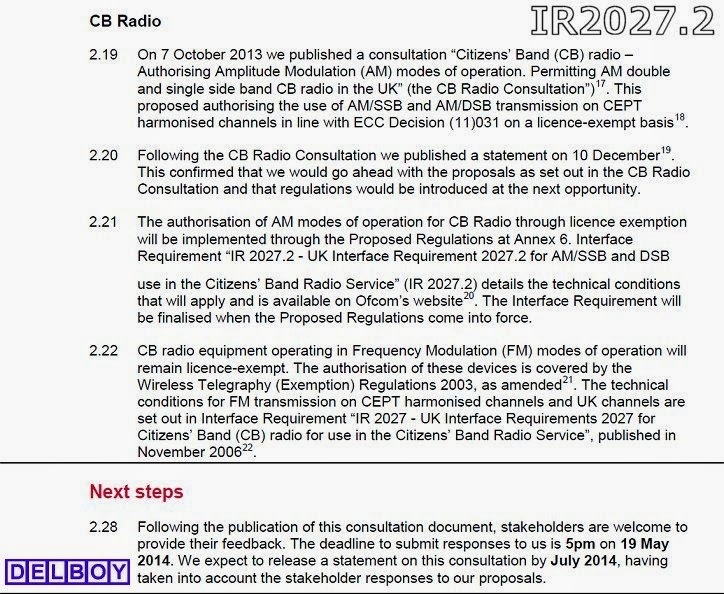 allow two different Amplitude Modulation (AM) modes of operation (AM double side band and single side band) to be used for Citizens’ Band (CB) Radio on a licence-exempt basis in accordance with our decision in our “Statement on Citizens’ Band (CB) radio published on 10 December 2013 (the ‘CB Radio Decision’)(-3-). 1.4 In addition the Proposed Regulations would also make certain changes to the current technical conditions for use of SRDs on a licence exempt basis in order to implement the requirements of “Commission Implementing Decision of 11 December 2013 amending Decision 2006/771/EC on harmonisation of the radio spectrum for use by short-range devices and repealing Decision 2005/928/EC (2013/752/EU)” (the ‘Amending Decision’). 1.5 In accordance with the requirements of section 122(4) and (5) of the WT Act, this document gives notice of our intention to make the Proposed Regulations. All of the changes that the Proposed Regulations would introduce have been subject to previous consultation by Ofcom with the exception of the changes to implement the Amending Decision. As a Member State of the European Union, the UK is bound by the requirements of the Amending Decision and therefore has to implement them by the deadlines set out in the Decision. Given this, we did not consider it appropriate to first conduct a policy consultation regarding the changes to implement the Amending Decision. 1.6 Comments on the Proposed Regulations are invited by 5pm on 19 May 2014. Subject to consideration of responses we intend to bring the new regulation into force by July 2014. An impact assessment for the Proposed Regulation is available at Annex 5 to this document. The Proposed Regulation is included in this document at Annex 6. Further copies may be obtained from www.ofcom.org.uk or from Ofcom at Riverside House, 2a Southwark Bridge Road, London SE1 9HA.